In the United States, our approach to vacation is unrecognizable to much of the rest of the world. In Sales, our approach to vacations is unappealing to many of our own non-selling colleagues. 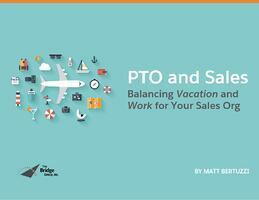 Download and access new research into how your peers handle PTO with their sales team. Plus, strategies and policies for making the number while treating your people right.